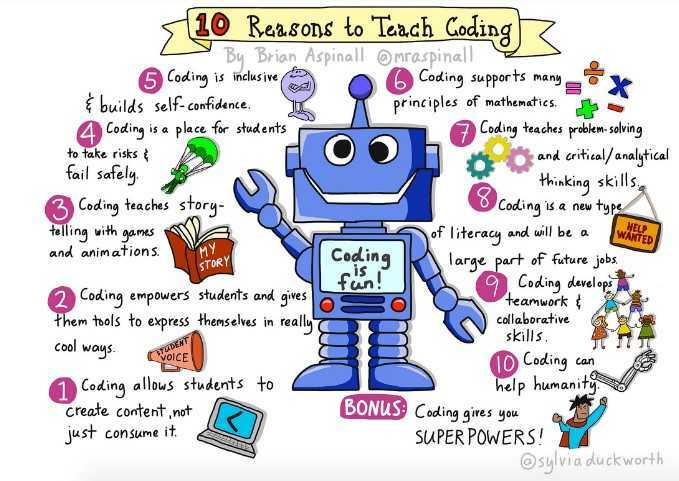 Currently there is a huge demand for schools to be teaching coding to young children. Programming literacy is an incredibly important skill that all children today will need to know. According to research, 90 percent of parents in the U.S. want their children to learn computer science—it will be crucial for many jobs in the near future—but only 40 percent of schools teach it. Experts argue that parents of every student in every school, at every level, should demand that all students be taught how to code. This skill is needed not because they will all go into it as a career—that isn’t realistic—but because it impacts almost every professional career in the 21st-century world. From a developmental perspective, the type of thinking that goes into learning to code is very sophisticated. It’s complex, multifaceted, and requires children to think deeply, not just recite back rote information. It’s the kind of thinking we want our kids to be doing for healthy expression of creativity, critical thinking, and abstract thinking. It is also fun for children to identify what coding programs do in everyday life as almost every vehicle, appliance, phones, and even some toys are programed. Educational coding programs are specifically designed to teach programming skills to young children in a fun and playful way. One highlight of the program Kodable is the way that it teaches sequential processing. The child directs an adorable little fur ball through a track using step by step graphic directions. The track becomes more and more complex as the child completes each level. Math, logic, reasoning, and predicting are all strengthened through a fun and interactive game. It is important to note that as with all things, balance must be maintained with coding programs and technology. Depending on the age of the child, time limits must be set. For a child ages four through six, a twenty-five minute time limit is appropriate. For a child seven through nine, thirty-five to forty minutes could be an appreciate time. Knowing your child and their attention span is important when gaging time limits. Technology should never be used to replace family connection and personal care. 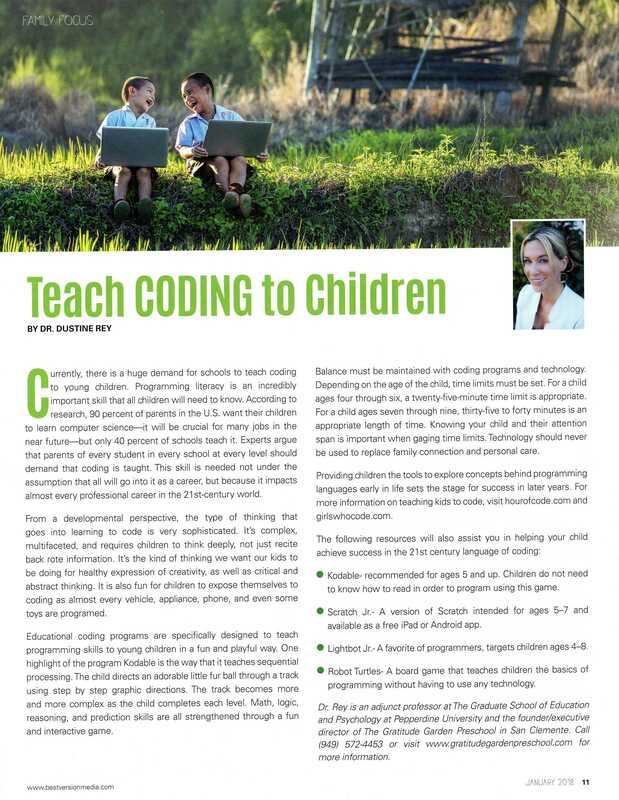 Providing children the tools to explore concepts behind programming languages early in life sets the stage for success in learning to code in later years. For more information on teaching kids to code, visit the Hour of Code website and Girls Who Code. Kodable– recommended for ages 5 and up, children do not need to know how to read in order to program using this game. ScratchJr is a version of Scratch intended for ages 5–7 and available as a free iPad or Android app. A favorite of some programmers, LightbotJr targets children ages 4–8. Robot Turtles is a board game that teaches children the basics of programming without having to use any technology.